Are your kiddos having trouble with CVCe words? If so I have the perfect center for you. Your kiddos will have so much fun using the magic e wands to change CVC words into CVCe words. 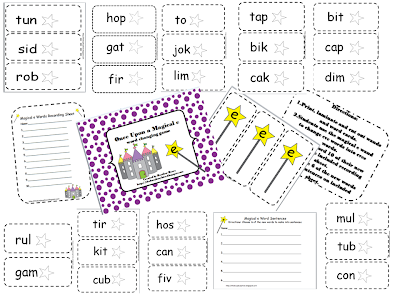 Use it in center or place the CVC cards around the room and have your kiddos practice their magic by finding and changing the words with their magic e wands. It is available at my TpT store for only $2. It's sure to be a class pleaser for the kiddos and you the teacher. Once Upon a Magical e is a silent e word changing game. Students use the magic e wand to change cvc words cvce words. 1 recording sheet to make 6 of the new words into sentences.